Right to Left Mr. Abdul-Aziz Al-Saad Al-Ajlan Vice Chairman of Riyadh Chamber of Commerce, Ghassan Kabbara prospower G.M. 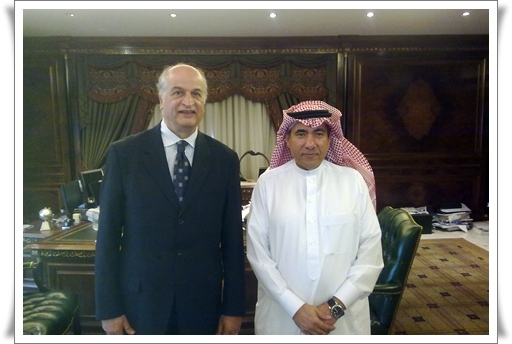 Within Prospower’s Saudi Tour to Promote TITF 2011, the General Manager Ghassan Kabbara met with Mr. Abdul-Aziz Al-Saad Al Ajlan, the Vice President of the Riyadh Chamber of Commerce & Industry in Riyadh on the 14th of May, 2011. In the meeting, issues were discussed related to the international trade fair TITF 2011 which will be held at Rachid Karami International Fairgrounds, Tripoli Lebanon from 21 to 25 September 2011. Mr. Ajlan showed interest in the trade fair and was very much concerned with initiating and expanding the trade and investment relations between Saudi Arabia with the Arab and Foreign countries through their chambers and trade associations and especially between the Saudi Arabian and Lebanese relations. Mr. Kabbara wished to receive a good participation of Saudi Companies in the international event and Mr. Ajlan promised to support the event by circulating a letter to all members of the chamber encouraging them to participate in TITF 2011, especially that exhibitors from South America (Argentina, Mexico) to China passing by some countries in Europe (Poland and Spain) and the Middle East (Turkey and Iran) will be present in the fair in addition to Lebanese Industrialist and Traders.